General Howe's headquarters in Dilworth before the occupation of Philadelphia. Born in 1729, General William Howe was both a British military officer and a Member of Parliament. He had served with distinction in the Seven Years, or French and Indian, War. In politics, he was known as a friend of the American colonists. 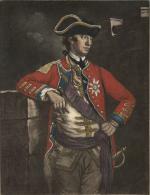 Yet when war broke out in the spring of 1775, Howe accepted an assignment as second in command of the British forces under General Thomas Gage. He became commander in chief in October 1775. Following the battle at Brandywine, General Howe offered to let General Washington send a delegation of physicians to the British encampment in order to take responsibility for wounded Americans left behind on September 11th. Dr. Benjamin Rush of Philadelphia, a signer of the Declaration of Independence and one of the country's leading medical experts, participated in the exchange and described what he saw in a blunt letter to John Adams, then a member of the Continental Congress. It's not entirely clear that Rush passed through the Valley Brook Farm area commemorated by this marker, but his description from this period in late September offers great insight into the imposing nature of Howe's operation as he moved across the Delaware Valley. "I was struck upon approaching Genl. Howe's lines," he wrote, "with the vigilance of his Sentries and picket. They spoke, they stood, they looked like the Safe-guard of the whole army." Dr. Rush was impressed, even a bit intimidated, by the professionalism of the British forces. "The wounded whom we brought off from the field," he admitted to Adams, "were not half so well treated, as those whom we left in Genl. Howe's hands." The cleanliness and order of the British camp contrasted sharply with what he perceived as mayhem at Washington's headquarters. Rush claimed that he was mortified to arrive in the American camp "without being challenged by a single Sentry." He pointed out that the wounded suffered terribly in American hospitals, noting "Upwards of 100 of them were drunk last night." For Rush, and many others, the odds of defeating such a Goliath seemed long indeed in the autumn of 1777. He warned Adams glumly, "we are on the brink of ruin." Robert J. Taylor, ed., The Papers of John Adams (Cambridge, MA: Harvard University Press), 1983.